It is good to hear from you. Good luck in life and in chess. Dedication to chess comes and goes, but the game will always be there. Best to you and your family and career! family first my friend. congratulations on the new career. "I scored an apprenticeship in a new career." As non americain i dont understand this. Is this something special, kinda like a promotion with huge pay raise? Dont worry about chess; it will still be there when the chess bug will bite you again. U1000 for life you are. MDLM made you that way. Anonymous, I really feel sorry for you. All, thanks for the well-wishes. Tiger, my new career's on a completely different track. I wouldn't call it a promotion, nor a demotion. It's just a change more in-tune with who I am. Securing an apprenticeship is a step forward. I had to compete for it. It does pay, but the pay's modest. PetrS, I suppose this is where I'm supposed to plug my patented Chess Diet(tm), the one true way to lose lots of weight and keep it off! But the truth is I try to avoid fads and lost 51 lbs. with the oldest of methods: I ate fewer calories per day than I burned. It's quite simple. First, I kept a food journal to track my eating--those who keep food journals, statistically speaking, lose more weight and are more likely to keep it off. I started at 3100 calories/day, but gradually got more and more brutal eliminating calorie-dense foods until I was eating 1300 calories/day. Then I added 200-400 kcal daily exercise. Eating 1300 calories/day and getting enough protein for a 6'4" man who is aggressively working out is quite tricky. I lost 20 lbs on my own, then to fight flagging motivation got a personal trainer who stuck by me for the next 30 lbs. She's also a nutritionist and gave me good tips (eg switching from yogurt to greek yogurt) to keep my protein high enough. Did dropping tactics in favor of 1.5 hours of cardio in the morning help? You bet. Was it essential? Nope. Now that 50 lbs. are off, I've switched to 2000 calories/day which is quite easy to maintain and get enough nutrients. I've also switched to some more active hobbies--hiking & photography. At some point I'll balance an active life, two careers, and chess. But for now chess is on the back-burner. 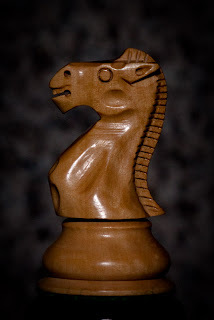 very interesting blog, the rook vs pawn endings are very usefull, but to bad you made a lot of mistakes in the notation, if you want to learn chess, you can't follow your analysis. I hope all is OK with you and your family! I’ve just got myself a 2nd hand copy(£1.90) of M.de la Maze’s rapid Chess improvement which is a padded out version of his article 400 points in 400 days which was initially published at chess cafe. Over the Xmas period I’ve decided to try out his chess vision drills, in particular his concentric square drills. My concern at this moment is realising 2 months down the road that I’ve been using his materials incorrectly. For example, the 1st part of the exercise he asks the student to confirm the fact that it is impossible with the white queen moving sequentially through all 64 squares to safely skewer/pin the black King which is permanently placed on the d5 square and the black rook which is on the d4 square. (....the positions in which the black king can recapture the black rook are not valid). I completed the exercise and found it to be true. It’s the 2nd part of the poorly explained exercised that is confusing. He continues the black rook starting out on d4 goes round the black king from square to square anticlockwise. E.g., d4, e4, e5, e6, c6, c4, c3, etc until if finally reaches the edge of the board. During this step by step process you are constantly searching for pins and skewers and whenever you hit upon a square that forks /skewers the king you bash down with the queen hard on your (glass) table. Repeating this and other drills over a 2 week period should eventually scorch these skewers/forks patterns into your brain cells. The result is that your ability to recognize forks and skewers at a glance at a chessboard should have greatly improved. I’ve completed moving the rook around the king via all 64 squares whilst the white queen is on the a1 square. There are no pins/skewers. My question is Do I then move the queen on to the a2 square and repeat the whole process again. In other words do I repeat the whole process with the queen throughout the whole 64 squares? Hey Likesforests, would you like to submit a few of your best posts? Just drop them in the comments to this or the one above. Some poser using your name has been extremely active on the chess.com forums.